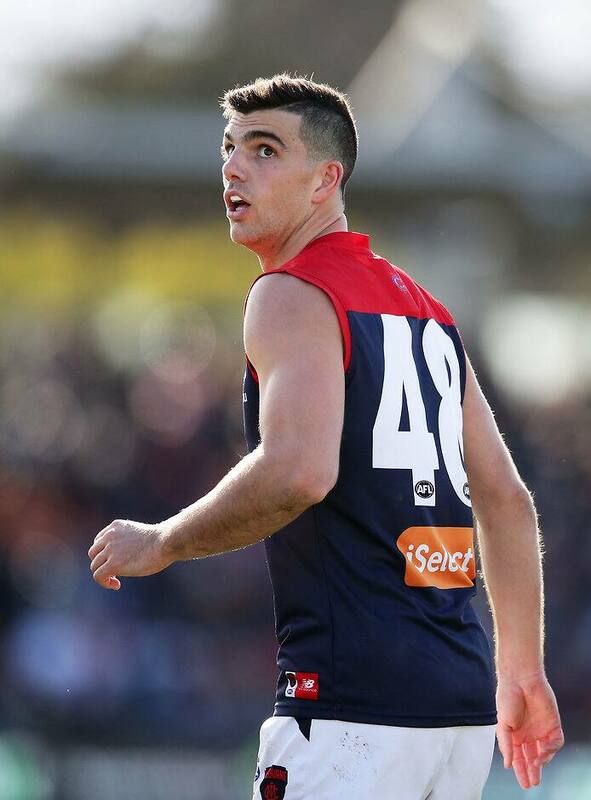 MELBOURNE rookie Corey Maynard has been rewarded for his rapid rate of development with a new two-year deal, tying the emerging midfielder to the club until the end of the 2019 season. The Demons have also agreed to terms with ruckman Mitch King, signing the developing big man until the end of 2018. Maynard, 26, is set to become a Category 'A' rookie and be eligible for senior selection in round one next season. If Maynard was retained as a Category 'B' rookie he would have to wait for a long-term injury to be elevated to the primary list. He was a late arrival to football after being recruited as a Category 'B' rookie to the club last off-season after a promising basketball career that saw him have stints with NBL clubs the Cairns Taipans and Townsville Crocodiles. Demons football manager Josh Mahoney said Maynard's professionalism in making the transition from basketball to football had stood out. "We were very pleased with his development throughout the year and had a dominant VFL finals series," Mahoney told AFL.com.au. "We look forward to him developing further and taking a spot as a Category 'A' rookie which will make him available for selection from round one. "His stoppage work is a really key strength and the pressure he puts on the opposition is very good as well." Maynard also played basketball in Finland after attending Bryant University, a small school in Rhode Island in the United States. He made his debut against Greater Western Sydney in round 20 following a stellar run of form in the VFL, gathering 18 disposals, laying seven tackles and kicking a goal in his first AFL game. The tough inside midfielder, the brother of Collingwood's Brayden, averaged 23.8 disposals from his 16 games in his maiden season for the Casey Demons in the VFL. However, his standout match came in a losing cause in the VFL semi-final against Richmond where he gathered 35 disposals (27 contested possessions), five marks, 18 clearances, nine inside 50s and five tackles and a goal. Maynard's 18 clearances were a VFL season-high with Casey coach Justin Plapp describing his performance as "probably one of the best performances I’ve ever seen at VFL level – in any game". Football is in the Maynard pedigree, with Corey's grandfather Graham Campbell playing 151 games for Fitzroy and coaching the Lions in a career that extended to the WAFL and SANFL. Corey's dad, Peter, played eight games with Melbourne between 1978-1981 before carving out a fine career with Glenelg in the SANFL, earning Hall of Fame honours at that club. King, 20, has had a tough start to his career at Melbourne after rupturing the anterior cruciate ligament in his right knee in his first year at the club in April 2016. The 200cm big man returned to the VFL fold after missing the first month of the season, starting in the VFL Development League and then for Casey's senior team. "We really liked the way Mitch developed through the year and we look forward to him having a good pre-season out of rehab and hopefully he can build into next season," Mahoney said.